Although the Dark Shadows 1991 revival series was favorably received when it started off, it soon lost its audience–quite literally, since episodes were frequently preempted by news reports during the first Gulf War; viewers didn’t know when they could see the next one. Sadly, the show was not renewed. I’ve finally gotten to the last episodes in my own recent, belated viewing. The 1790s storyline has progressed more or less as expected, with only minor variations in the details. Although there are some nice touches here and there, it’s in the modern-day story that the real twists come–including one event that completely astonished me, and which I wouldn’t dream of giving away to anyone who hasn’t seen the series. 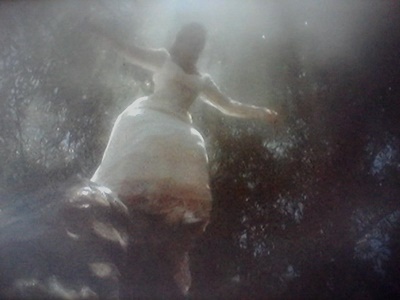 In the previous episode, Josette agreed to leave Collinwood; Vicky convinced her that if she didn’t stay to die at Widow’s Hill, then Vicky herself would be saved and be able to return to her own time. In spite of these good intentions, Josette’s resolution doesn’t hold up once she discovers that Barnabas is still over at the old house. So happy is she to see him again that all thoughts of Vicky and her own documented fate go out of her head. Once he reveals that he’s become a vampire, she even offers him a bite of her throat. Josette’s father and aunt find her in her bedroom at the old house the next morning. They convey her back to the brand new Collinwood. She speaks of Barnabas and her wish to join him, but they take that as a sign of her grief over his recent death. The Countess believes a vampire is at work, and attempts to protect her niece by hanging garlic on the windows–but it doesn’t yet occur to her or anyone else that Barnabas is that vampire. The Countess’s precautions do no good. While they are effective at keeping Barnabas from getting into Collinwood, they don’t stop Josette from going out. He has only to use his telepathic powers to summon her (and make the Countess, who is sitting watch beside her bed, fall asleep); Josette changes into her wedding dress and heads over to the old house. Once again, Barnabas anticipates a happy reunion with his beloved in spite of all Angelique’s spells and the curse she placed on him. But even though she’s dead, Angelique remains determined to keep Barnabas and Josette apart. What good is her revenge if they can enjoy a vampiric existence together? 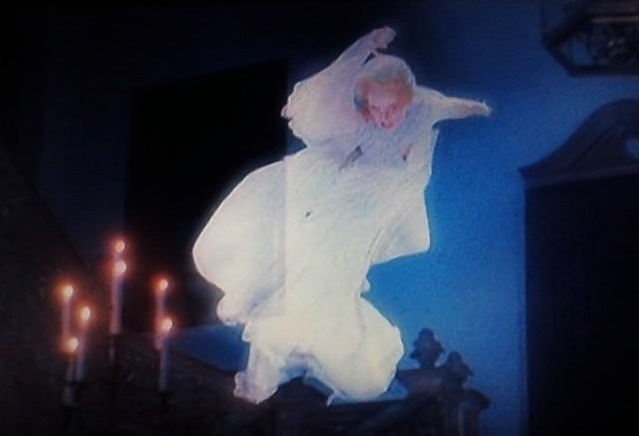 Just before Josette meets Barnabas, Angelique sends her visions of what Barnabas has become–scenes of his attacking and biting people from earlier episodes, even the ones set in the 1990s. She then shows Josette herself as a vampire. Vampire Josette doesn’t look ghastly and undead–still quite pretty–but she does have fangs and blood smeared around her mouth. Horrified at this image, Josette flees into the woods. Barnabas runs after her, chasing her all the way to Widows Hill. 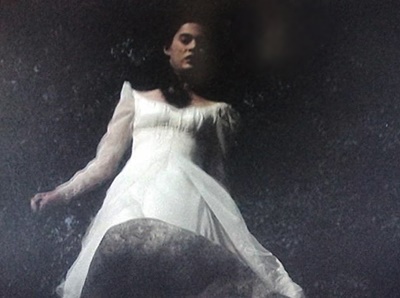 Rather than become a vampire, Josette chooses to meet her fate on the cliffs. The episode doesn’t end with this tragic scene, but concludes with the verdict of Vicky’s trial for witchcraft. In spite of a spirited defense by Peter Bradford, testimony as to her good character from Joshua Collins, and even Ben’s statement of how it was Angelique who bewitched him, things aren’t going well for Vicky. Abigail, the one member of the Collins who has had it in for her from the beginning, testifies about Vicky’s mysterious appearance coinciding with the equally mysterious disappearance of the expected governess, Phyllis Wicke. The 1990s dress Vicky was wearing on her arrival is also brought out as evidence of her witchery. Worst of all, Trask has got hold of the big book of Collins family history that Vicky brought with her. The Collinses have been aware of it for at least a few days; they all knew what it said about Josette and tried to prevent that from happening. Once Vicky is called to the witness stand to explain how she possesses a book that foretells the fates of the family, she tells the truth: both she and the book have come from the future. Time travelers aren’t held in any higher regard in colonial New England than witches are. A surprise appearance by Angelique, in spite of being dead for at least a couple of weeks, doesn’t help. The final episode picks up just after the end of Vicky’s trial. Joshua and Peter are off to see the governor and have the verdict overturned. Peter promises he’ll return with a stay of execution. Meanwhile, Josette’s family has departed from Collinwood, taking her body back to Martinique to be buried; her ghost never haunts this revival version. Naomi, already shattered by the deaths of her two eldest sons, is distraught about this latest tragedy… but there’s worse to come. 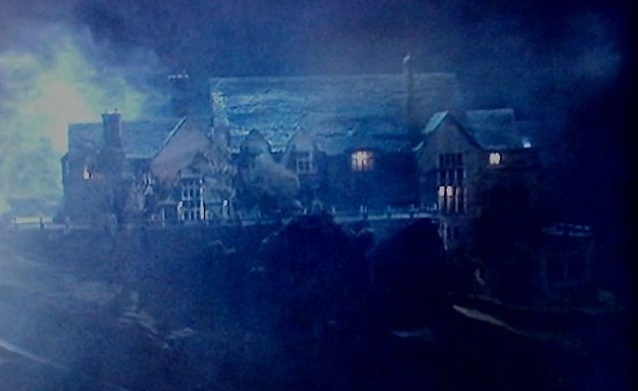 As she stands on the magnificent Collinwood staircase beneath the portrait of Barnabas, she hears what she takes to be his voice, pleading for her to come to the old house and help him. That this isn’t actually a plea from Barnabas becomes apparent as soon as Naomi leaves; we hear Angelique’s trademarked Evil Laugh. Over at the old house, Naomi discovers Barnabas–hearing sobs, she ventures up to Josette’s room and finds him sitting with his head in his hands, grieving over his beloved’s death. When she sees the son she thought dead (and remember, this isn’t the first time one of her boys has returned from the grave), Naomi faints. Young Daniel and Sarah awake with a premonition of disaster. Aunt Abigail won’t let the two children go over to the old house after their mother, but she does go there herself and up to Josette’s room. Naomi is sitting stunned in the chair where she found Barnabas. Barnabas himself returns to the room a moment later, bringing his mom a glass of water. Abigail runs screaming down the stairs, and Barnabas runs after her. At first, he tries to quiet her and explain, but when she won’t shut up he ends up sinking his fangs into her neck. Then he hears someone screaming behind him. It’s not his mother; Sarah and Daniel have followed their aunt and are standing in the front hall below, witnessing this horrible scene. They run back out of the house, and Barnabas goes after them, begging them not to be frightened of him. While all of this is essentially tragic, the way the scene plays out is also bizarrely hilarious as things spin out of poor Barnabas’s control and get worse and worse. He really needs to stop chasing people–it never helps the situation. It’s raining again as the two kids run into the woods to hide. Barnabas doesn’t find them, but a search party does in the morning. They are soaked, shivering, and both dangerously feverish. Joshua also finds Abigail’s body on the stairs and his wife still sitting in Josette’s room, completely detached from reality after what she’s seen that night. He takes her gently home and orders the old house sealed up. While he’s there boarding up the door to Josette’s room, the place which he believes is most cursed, he encounters Barnabas for himself and realizes what his son has become. This version of Joshua Collins has never been as rigid and unfeeling toward his family as the man in the original series, but the moment between father and son is a touching one. Joshua also brings Barnabas up to date on what’s been going on with Vicky, and Barnabas wants to do something to help her. Peter is back, but with no pardon or stay of execution, although he remains hopeful that one will be forthcoming. When he visits Vicky in her cell, they discuss these latest tragic events up at Collinwood. Then a moment occurs that absolutely delighted me when I first saw it, that made me love this revival series and Joanna Going’s Victoria Winters. As she and Peter talk about the recent vampire attacks in Collinsport, Vicky recalls the very similar attacks that occurred in her own time. “Oh, my god!” she exclaims, and you can almost see the lightbulb go off over her head (except that they haven’t been invented yet). She realizes what the original series Vicky never did: that Barnabas Collins in 1991 is Barnabas Collins from 1790. Not a descendant from England. Not a reincarnation. Same guy. And he looks exactly the same 200 years later because he’s a vampire. The vampire. You go, New Vicky! Figuring things out! Perceiving this, Vicky understands why Angelique has it in for her. She also finally figures out what it is she’s meant to do here in the past to save the Collins family in the future. As this final episode drew toward its close, I began to worry that I wouldn’t get to see Trask receive his traditional comeuppance, but Barnabas comes through at the last minute. The Witchfinder is forced to write a retraction before he gets bricked in. 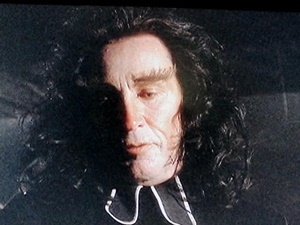 Barnabas gives this to his father, believing he’s saved Vicky. He returns to his coffin in the hidden crypt one last time, and asks his father to drive a stake through his heart at sunrise. But we all know that’s not how Barnabas ends up. Joshua can’t bear to stake his son and chains the coffin shut instead, to await Willie Loomis questing for jewels 200 years later. Peter triumphantly delivers Trask’s statement to the judge the night before Vicky’s scheduled execution… but Angelique intervenes once again. As Vicky is brought to the gallows in 1790, Phyllis Wicke gasps out her last diphtheria-choked breaths 200 years later. Dr. Hoffman desperately tries to revive the governess as a storm rolls over Collinwood (there are always storms over Collinwood). There’s a flash of lightning, and the room grows dark for a moment. When the lights come on again, Phyllis has disappeared. Vicky is lying in bed in her colonial-era clothes. Since the modern-day Collinses have been aware all along what happened to her, her reappearance in this state comes as no big surprise; they’re just happy to have her safely home. Back in 1790, the hangman lifts the hood from the body of the dead woman. Poor Phyllis. Vicky sits up to hug Elizabeth–and sees Barnabas standing there. Their eyes meet. He knows that Vicky knows the truth about him. Frustratingly, the final show ends there. I was very sorry to see the series conclude so abruptly. I wish there’d been more, and I can’t help wondering how much of the original series plotlines Dan Curtis meant to follow again. Does the allusion to Roger’s wife Laura mean that the Phoenix story would have been done? Was Angelique’s incursion into the 20th century meant to introduce “Cassandra” and perhaps eventually Nicholas Blair? Would there be a Quentin? And what happens next now that Vicky knows about Barnabas? There is an indication that Jeff Clark was intended to show up in the 2oth century following Vicky’s return (and this might explain why Michael Weiss was cast as he was in the 1790s timeline). What this short-lived series reminds me most of is the earliest episodes of Star Trek: The Next Generation from 1987-88. Like Dan Curtis, Gene Roddenbury was reviving a beloved fan-driven phenomenon from the 1960s–but what was strikingly innovative for television in 1966-69 was somewhat old fashioned by the late ’80s/early ’90s. The sexed-up scenes in particular seem to me to be more quaint and amusing than hot stuff. In addition, both show a tendency to recycle old stories. Recycling is good, as men who were brought up to keep their budgets low in television’s early days certainly learned, but nostalgia will only take you so far. The Next Generation did eventually strike out away from the original Star Trek and managed to be a success on its own. I’d like to think that the new Dark Shadows would have done the same in the 1990s if it’d had been given the chance to grow.